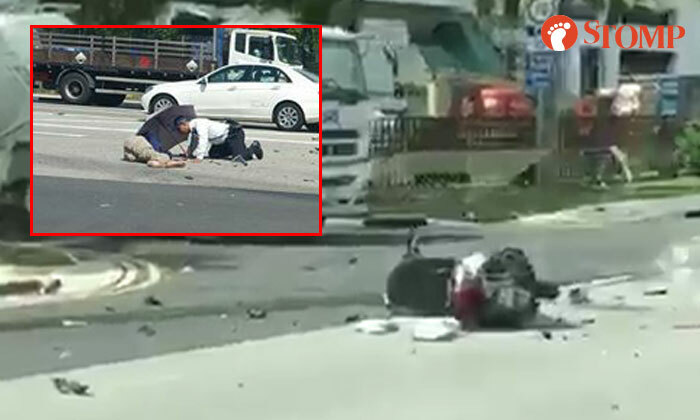 Seven people were taken to Ng Teng Fong Hospital (NTFH) following an accident involving a trailer, lorry and motorcycle at the junction of Tuas West Road and Tuas Link 4 yesterday morning (Sep 25). Stomper Manoj took a video as he was passing the scene of the accident. In the video, a motorcycle can be seen on the road as well as several pieces of scattered debris. An ambulance was at the scene and Traffic Police (TP) were seen diverting traffic. A police spokesman told Stomp that the police were alerted to the incident at 7.34am. A 30-year-old motorcyclist and six lorry passengers between the ages of 22 and 25 were conscious when taken to NTFH. The 45-year-old male trailer driver was arrested for dangerous driving.